Key Safety - How Safe Are The Keys? While having a full set of keys on one person may seem convenient, it does create a security issue that can result in unmanaged access, lost keys or stolen property. 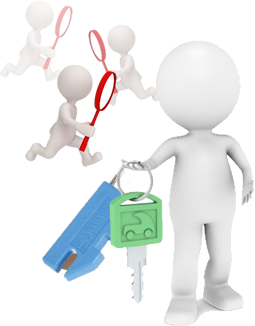 A proven solution for controlling and safeguarding keys in any of these scenarios or countless others is a key control and asset management system. Keys are secured in a specially designed cabinet that can be configured to store any number or type of keys. Key control software allows access only to authorized users and all key access activity is automatically recorded for tracking purposes. Designed for convenience as well as security, electronic key control systems make it easy for users to access or return keys with illuminated key slots and return anywhere features. Management is also better able to control and track key usage with online monitoring. Any unscheduled activity such as a key not being returned on time or a key cabinet door left open will automatically trigger an alert and management will be notified via text or email messaging. Compatibility with other security systems and network access offer added richness and usability to a key control and management system, while integration with existing databases saves time and money. Built-in RS-232 communication ports allow ease of use for direct connectivity to printers or other devices, or networked connectivity via Ethernet. Systems can be tailored to individual requirement, and updated as time goes on. Key control cabinets and locker modules can be added where and when as needed and each additional module can be controlled by a single console and monitored by the software. Unsecured keys can open vulnerabilities as well as doors. A key control and management system is a cost effective and reliable solution for ensuring the safekeeping of keys.